Dropping knowledge... and throwing some shade at the haters. 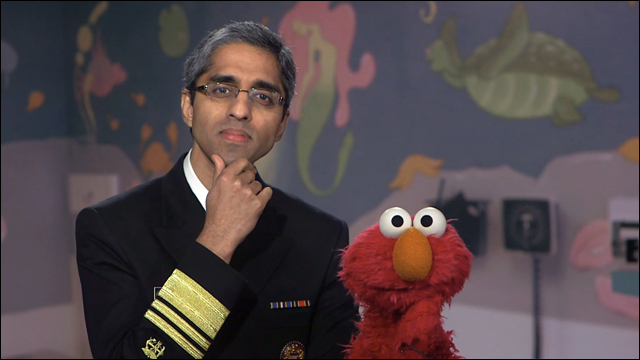 The nation's head public health official (and former Angry Reader of the Week), Surgeon General Vivek Murthy, recently paid a visit to Sesame Street to chop it up with the one and only Elmo, who was a little nervous about getting a shot. Dr. Murthy explains how vaccines work, and why they're so important for children's health. They also manage throw in a little shade at anti-vaxxers. Boom. Knowledge dropped. Brought to you by the U.S. Department of Health & Human Services, Sesame Street and The Daily Dot. You can find more information and resources about childhood vaccinations here.